Way back in 2004—when Mac Gems was in its infancy—I reviewed Pacifist 1.6, a nifty utility for working with Mac OS X installer packages (.pkg and .mpkg files). If you’ve ever wondered what an installer package is going to install, Pacifist can tell you: You just drag the package onto Pacifist, and the utility shows you a hierarchical (and searchable) list of every item contained therein. You can even see detailed information about each file: permissions, file size, file type, and more. But as I explained in that review, Pacifist’s other big appeal is that it lets you verify installations, as well as extract or install any file from within a package. For example, if you recently updated OS X via an installer package, and now you’re having problems, you can open the update’s installer package in Pacifist and click the Verify button, and the utility will check to see whether all files were installed correctly and have the right permissions—issues listed in this report may indicate an installation problem, and reinstalling the update might fix it. Similarly, if you discover that an application or a file is damaged, you can use Pacifist to get a clean copy of that file by opening the installer package in Pacifist (assuming of course, the item was installed from an installer package). Just select the desired file(s) and either click Extract to save the file(s) to a location you choose on your hard drive, or click Install to install the file(s) as if you were using the Installer utility. Since that review, Pacifist has seen scores of improvements, and Pacifist 3.1 is even better than the version I covered all those years ago. For starters, Pacifist now also supports BOM files and .dmg disk images, as well as .tar, .tar.gz, .tar.bz2, .xar, and most types of .zip archives. (If these formats mean nothing to you, that’s fine—you probably don’t want to be using Pacifist to work with them unless you know what they are.) It can even handle the Lion installer, which is an app package. If a .pkg, .zip, or .xar archive is stored remotely, you can give Pacifist the archive’s URL, and the utility will quickly download just the part(s) of the archive necessary to display its contents, downloading more only if you request it. Pacifist can even create a receipt package when installing files. A convenient improvement is that Pacifist lets you view some types of files—text, RTF, RTFD, HTML, and Word files, as well as images, scripts, and more—without having to first extract them to your drive. The current version also comes with a Quick Look plug-in, so if all you want to do is view a package’s contents, you can do so in the Finder using Quick Look. 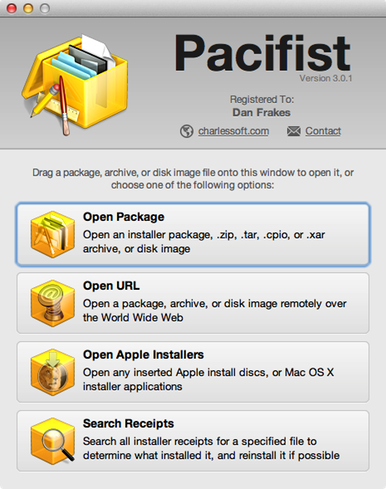 Pacifist also provides a few useful features that don’t revolve around opening a particular installer package. The Kernel Extension Report examines the contents of /System/Library/Extensions and provides a report listing each extension’s name and bundle identifier, as well as whether it was provided by Apple or installed by a third party. (When possible, Pacifist also displays the name of the installer receipt referencing a given extension.) And if you want to reinstall an application or a particular file, the Search Receipts feature will search all the installer receipts on your hard drive to determine which specific installer(s) the item came from—if you still have all the applicable installers, Pacifist can then extract the application or file. And a Software Update Packages report lists Software Update packages currently available from Apple. As I mentioned in my original Pacifist review, because the utility is so powerful, it can be dangerous—installing a wrong or incomplete version of a vital system file could, in a worst-case-scenario, render your system unbootable. (If you need to reinstall an application, you should install the full application first, and then install any updates.) And you shouldn’t use it to install an entire OS or OS update, as Pacifist doesn’t run the pre- and post-install scripts used by most OS updates, and even by some application installers and updaters. But Pacifist is nevertheless a useful tool, especially for troubleshooting—there’s nothing else like it. Want to stay up to date with the latest Gems? Sign up for the Mac Gems newsletter for a weekly email summary of Gems reviews sent directly to your Inbox. You can also follow Mac Gems on Twitter.